This week’s update has been generously provided by Bearman of the fantastic BEARTOONS online comic repository. Bearman normally works on the editorial/commentary side of things and true to form, he took the news of my son’s recent arrival and ran with it. I really like his take on my characters, particularly Faraday, and amazingly he managed to get the baby pretty much spot on too. This entry was posted on Saturday, December 11th, 2010 at 1:38 am and is filed under Comics. You can follow any responses to this entry through the RSS 2.0 feed. You can skip to the end and leave a response. Pinging is currently not allowed. Congrats on the new baby! You can kiss sleep good bye unless you go check into a hotel, and your wife might not appreciate that. Is Alan the elf or the blob in this cartoon!? Nice rendering of the characters, Bearman, and all-around great guest strip! Thanks for all the congrats, guys! Is Dara your child’s name? Or was this perhaps some sort of reflection on Dara O’ Briain? 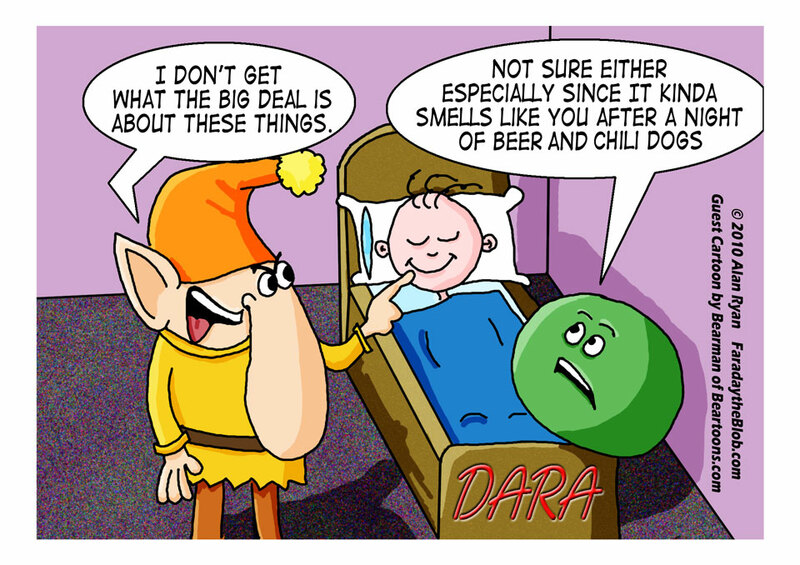 Yes, Dara is our son’s name! I did hear that Dara O’Briain sleeps like a baby though, on top of a large pile of money. Nice comic hahah! made me smile! Nice rendering of the characters and the dialog is good! Great! Congrats on the new baby!